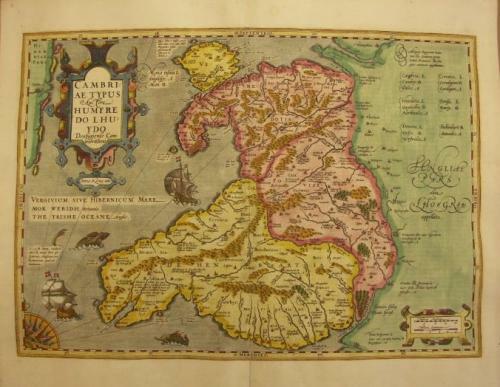 An ancient map of Wales, originally prepared by the Welsh cartographer Humphrey Lhuyd and reproduced for famous the Mercator Hondius atlas of 1642. The map is decorated with a fine cartouche, part of a compass-rose and a sea monster. The condition of this map is excellent and the paper is of good quality with little age toning. A couple of small chips in the margin, well away from the image area, otherwise excellent.